Bernini, perhaps more than any other artist of the time period, was responsible for defining the Baroque style of sculpture. His works are fraught with emotion and tension, achieving a hitherto unseen level of life-like action. 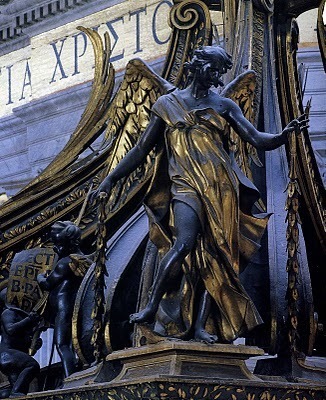 Whether in his sculpture, architecture, or multimedia works, Bernini's pieces can always be recognized by their minute attention to detail, grandiose theatricality, and ornate design. 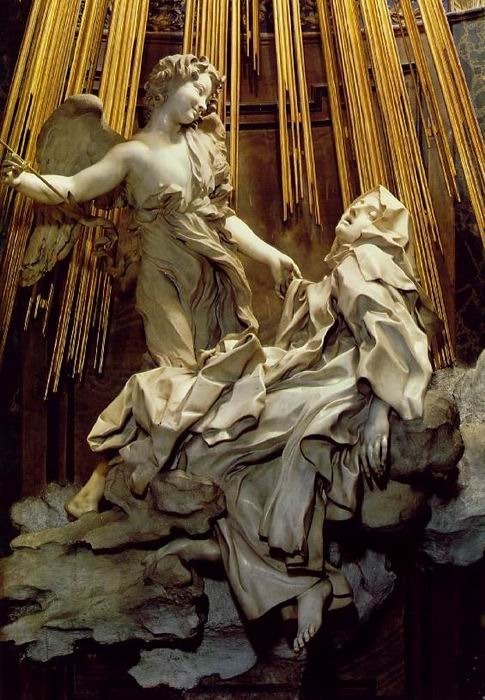 Both due to the religious fervor of Bernini himself and the fact that the majority of his commissions were given by religious figures, a high percentage of his work was religious by theme. However, perhaps due to the influence of the classical collections of Scipione Borghese, one of his first patrons, Bernini also had a persistent interest in mythological figures. Additionally, due to the patronage that he was driven by, Bernini executed a series of portraits, both in painted forms and sculpted busts. Drawing from the influences of Mannerist artists, Bernini created swirling, dynamic compositions in his sculptures that were meant to be viewed from all directions, inviting the viewer to be a part of the scene. Energy and movement are essential to his composition. While the statues of classical Greece or the high Renaissance are still and composed, as if posing for a picture, the viewer always catches Bernini's figures in the middle of a grand gesture. Straining muscles, chaotically swirling draperies, and flowing locks of hair all help to convey an overwhelming impression of dynamic force. Often his figures are posed on diagonals, characteristic of Baroque sculpture. This helps to emphasize the tension within the figures' movement. A highly religious man with a distinct intensity of character, Bernini wished to impart a sense of theatricality and drama that would move his spectators and leave them in awe. 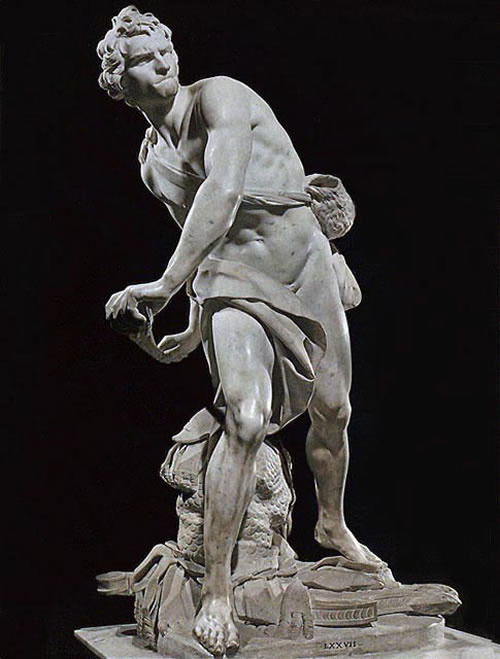 Bernini is famous for portraying the most poignant moment in a story (his David, for example, is shown in the midst of bringing Goliath down) and for communicating that event in the most dramatic way possible, by means of exuberant movement, emotive facial expressions, and feats of technical mastery. In his combination of mediums, such as The Ecstasy of St. Teresa, he created a higher dramatic effect more reminiscent of theatrical tableau than previously seen sculptural works. 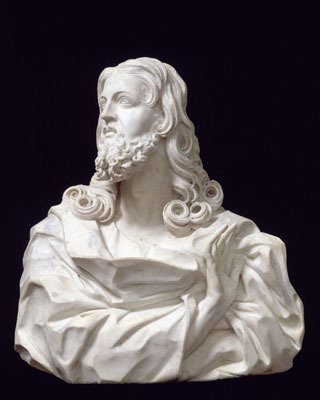 Whether it be billowing swirls of fabric, luxuriously curling locks of hair, meticulously veined leaves, the roughness of tree bark, or the supple softness of skin, Bernini paid texture a great deal of attention in his sculptural works. Viewing one of his works becomes more than a visual experience; it is tactile as well, adding to the overall sense of amazing realism. Like Caravaggio, Bernini's triumph is his ability to make anything, from the gods and nymphs of Greek mythology, to Biblical heroes, seem real and of this world. Although his figures are always somewhat idealized, like a perfected version of reality, Bernini manages to bestow them with individualized features and imbue them with human emotion, and never neglects the careful details that help to bring his sculptures to life. 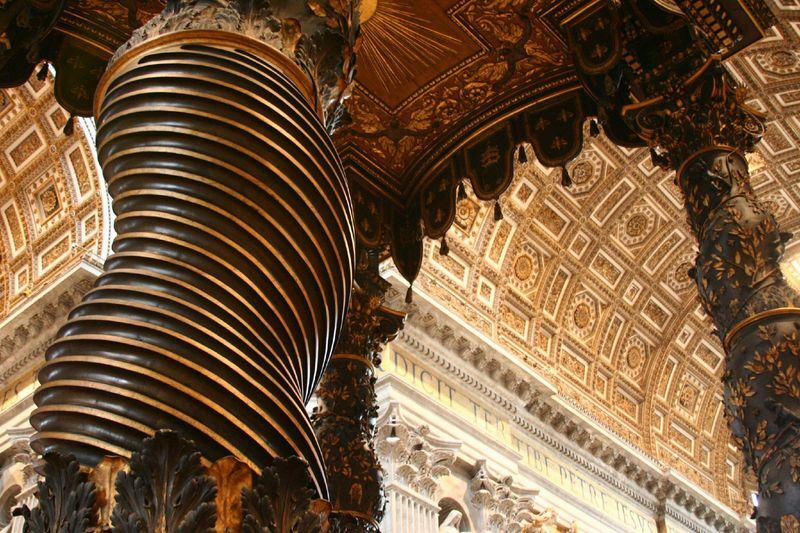 A work of Bernini's is never static. Even in his architectural works there is always the illusion and sense of movement that is so characteristic of this great artist. Lines are seldom straight; curves abound. From the spiraling columns of the Baldachin that draw the eye heavenward to the flutters of the fabric in his portrait busts, all of his works give the sense of being a snapped moment of stillness in the frenzy of motion. 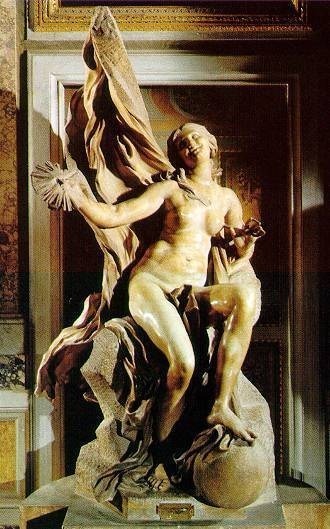 Bernini was a one of a kind artist, the likes of which have not been seen since. One of the ways in which he pioneered Baroque art was by combining different mediums into one larger artwork. Through the combination of sculpture, architecture and painting he created a new idea of what an artwork could encompass. One of the foremost workaholics in art history, Bernini toiled uniformly throughout his career, working seven hours a day without pause even in his old age. It is said that his younger assistants could not manage to keep up with him. Strict in his schedule, mornings and evenings were reserved for prayer and church with the rest of the day used for labor, seven days a week. 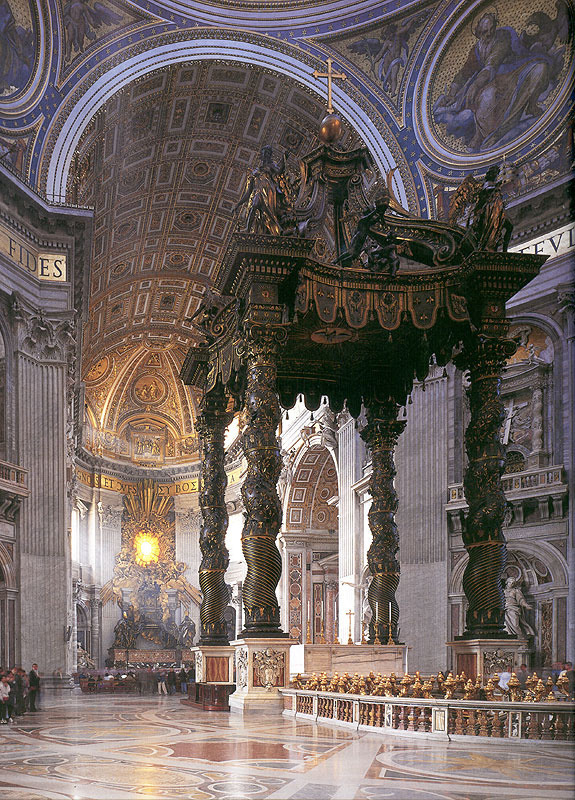 To achieve the ornate effects in architectural works such as the Baldachin, Bernini used a method of casting called the lost-wax method, ancient and painstaking process. In this method, the first step is to create a wax original model of the sculpture. In the case of the baldachin, he used real life objects such as lizards or leaves to create an extremely life-like appearance. Molten bronze is applied to the hollow, melting the wax or disintegrating the lizards as it were, causing contemporaries to call his method of casting the "lost-lizard method."